Fill your basket with any item regardless of the price and receive free shipping. Valid for 5 days only, ends Monday 11:59pm, April 15th. Discount automatically applied at the time of checkout. Simply add any product to the cart that meets the requirement and the discount will automatically be applied. *Offer only valid on full price items with the offer callout applied, excludes sale, promotions, "Mix & Match" and Skip Hop. Mix and Match is only valid on items with the mix and match flag. These items can not be combined with other offers or promotions. Every effort is made to ensure stock is available, however, there may be periods whereby stock has been sold prior to stock levels on the website being updated. All care is taken to ensure accurate colour representation although slight differences of colouration may occur due to photographic and printing processes. All products are advertised in good faith and we reserve the right to correct any errors or misprints should they occur. The Carter's - OshKosh team makes every effort to get your orders to you as soon as possible. Free Shipping for orders $60 or more. $8.95 flat rate shipping for orders under $60. Free Returns is only valid for Silver & Gold customers on orders over $60. The delivery time-frame is within 3 - 6 working days of the order date. Shipping and delivery is currently within Australia only. Please email us at customerservice@oshkosh.com.au if you have any queries. All items purchased from our online store within 30 days of receiving the goods may only be returned for a full refund. We no longer offer exchanges for change of mind or sizing, we only provide a full refund. Once the item is received by our team we'll process a full refund and ask for you to re-order the correct item online. Free shipping on replacement items will only apply to orders over $60. Should you have any further questions please email us at customerservice@oshkosh.com.au. © Skye Group Pty Ltd. The Terms and Conditions as set out in this document concern the operation of The Carter's | OshKosh Membership Club, the use of the Carter's | OshKosh Club, the OshKosh website, and any promotional activity, including loyalty transactions that arise as a consequence of the Carter's | OshKosh Membership Club. By use of the Carter's | OshKosh Membership Club the customer agrees to the Carter's | OshKosh Club terms & conditions as laid out herewith and any amendments that may occur from time to time. The Terms and Conditions outlined below may be modified at any time without prior notification by Carter's - OshKosh in its absolute discretion. Despite anything contrary contained in this document, any modification to the Terms and Conditions may be applicable to a member retrospectively. Carter's | OshKosh Australia will not accept any liability for any email communication to any Member that is misdirected, lost or not received. In its absolute discretion Carter's | OshKosh Australia reserves the right to cancel, terminate, modify or suspend the Carter's | OshKosh Club at any time. Membership to The Carter's | OshKosh Club is only open to individuals. It is not transferrable and may not be used by any person other than the cardholder. The Carter's | OshKosh Club Card is not a credit card or charge card and the rewards earned or redeemed are not redeemable for cash. The Carter's | OshKosh Card remains the property of Carter's | OshKosh Australia. Membership of The Carter's | OshKosh Club is open to individuals with a valid email address and requires the member to receive automated email communication. This does not include our marketing and sales promotions. Carter's | OshKosh Club vouchers can only be redeemed if the membership is officially registered. Carter's | OshKosh Club vouchers have an expiry date and vouchers must be used prior to that date. Only one Carter's | OshKosh Club Card per transaction is permitted. A member must notify OshKosh Australia immediately of any change of address or lost or stolen membership card via email: customerservice@oshkosh.com.au. The Carter's | OshKosh Club Program is not responsible for lost, stolen or damaged cards. Carter's | OshKosh Club Vouchers are offered at the absolute discretion of Carter's | OshKosh Australia and reserves the right to withdraw, cancel, vary or in any way change this at any time without prior notice. Carter's | OshKosh Club Vouchers are earned based on Nett spend - which is all purchases minus spend and save vouchers, upgrade vouchers and anniversary vouchers. Carter's | OshKosh Australia will aim to notify members of any changes but shall not be liable in any way for failure to so. Carter's | OshKosh Australia may cancel membership at any time without notice for any reason, including if the member fails to comply with these terms & conditions, supplies any misleading information, makes misrepresentation to Carter's | OshKosh Australia or any participating store or abuses any privilege afforded to the member. A member may terminate membership any time by contacting Carter's | OshKosh Australia via customerservice@oshkosh.com.au. All vouchers must be used at the time of a transaction and cannot be deducted after the transaction has been completed. Vouchers cannot be redeemed for cash. Refunds / Credit Notes: Should a product be returned for a refund or credit note, any voucher that has been accrued may/or will become null and void. Members of the Carter's | OshKosh Club receive a Spend and Save Voucher to the value of $10.00 for every $100.00 spent. The Spend and Save Voucher can be redeemed on the customer's next purchase of $80.00 or over, within 30 days upon receiving. A Club Member may use multiple vouchers in a single transaction, as long as the transaction spend is $80 or more. 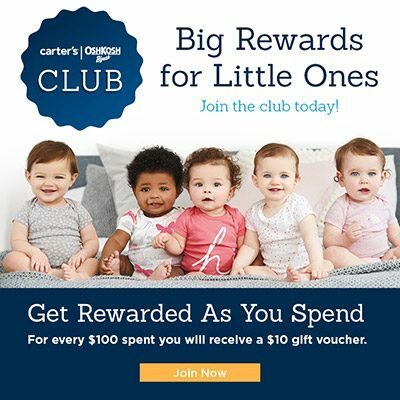 Carter's | OshKosh Australia staff members and sales associates are not able to receive and participate and club benefits or rewards. If you have any questions regarding the Program, you may email customerservice@oshkosh.com.au. The Program and these Terms are governed by the laws of New South Wales in Australia, without giving effect to any principles of conflicts of laws. You hereby consent (or, if you are a minor, your parent or legal guardian hereby consents) to the exclusive jurisdiction of courts having authority over matters arising in New South Wales in all disputes arising out of or relating to these Terms or the Program. 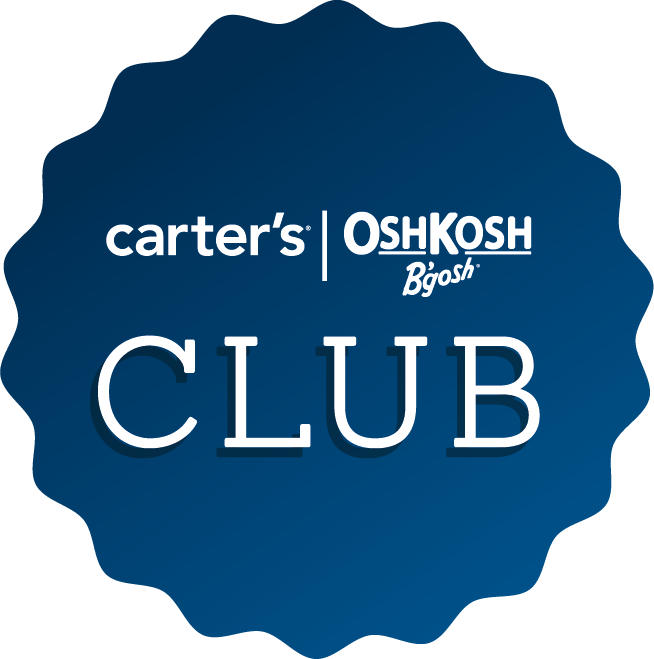 On-line: All Carter's | OshKosh Club Vouchers can be redeemed and earned on online transactions.